Eating healthy doesn't have to be pricey; even penny pinchers can load up on nutrient-dense foods. Here's how! You may assume that eating healthy has to be expensive. Make a commitment to organic foods and meats from higher-quality sources (here's looking at you, $15-a-pound grass-fed steak), and your food budget could very well make that gym membership seem like a bargain. But contrary to popular belief, eating healthy can be possible for penny pinchers and anyone looking to save a few bucks; you just have to know how to seek out foods that deliver the most nutritional bang for your buck. If you're like everyone else and hoping to trim your grocery bill while beefing up your cart with nutrient-dense options, look no further than these stealthy health foods that won't break the bank. While quinoa gets a lot of attention in the press, millet still largely flies under the radar. But you can stock your pantry with this gluten-free, nutrient-packed whole grain for less than half the price of much-hyped quinoa. A long-time staple grain in Asia and Africa, millet has a corny flavor and boasts hefty amounts of antioxidants and essential nutrients, particularly magnesium. One cup of millet provides 57 percent of your recommended daily magnesium intake! This is significant, given that magnesium is the third most common nutrient deficiency in the United States. Plus, a 2016 study published in Nutrition Journal found that adults with higher magnesium intakes were 48 percent less likely to have hypertension, 69 percent less likely to develop type 2 diabetes, and significantly less likely to develop heart disease compared to those with the lowest intakes of magnesium. In the kitchen: Simmer one cup of millet and a couple pinches of salt in two cups of water or vegetable broth until the millet is tender and the water has been absorbed, about 20 minutes. Remove the pot from the heat, let the millet stand covered for five minutes, then fluff it with a fork. Try mixing it with chopped vegetables and a dressing for a healthy salad. When you think of protein-rich seafood, you most likely think of salmon. This fish packs a hefty amount of protein, along with heart-healthy omega-3 fatty acids, but often comes with a hefty price tag as well. Additionally, farm-raised fishing tactics, antibiotics, and other methods that may diminish the quality of your fish are often used. The same applies to shrimp, too. Fortunately, you can find another protein-packed, nutrient-rich option for less than half the cost in the same section of the grocery store—mussels! Mussels are generally farm-raised; however, they're done so in a sustainable way without exposure to antibiotics or any other meat-tainting methods. These critters have little impact on the ecosystem and are widely considered one of the most sustainable options you can eat. Mussels pack a large amount of omega-3 fatty acids. Additionally, they are rich in free-radical-fighting selenium (109 percent of the daily recommendation), and an excellent source of vitamin B-12 (340 percent of RDA). Oh, and did I mention that a mere 3-ounce serving of mussels provides 20 grams of protein? Fortunately for you, all of this can be found at just under $2 per pound. In the kitchen: Mussels are easy to prepare. First, rinse the mussels. Then, place one cup of liquid such as water, broth, beer, wine, or coconut milk in a large saucepan; use one cup of liquid for each pound of mussels used. Bring to a boil, add the mussels, reduce the heat to medium-low, and simmer the mussels covered until they open up, which should take about five minutes. Discard any that don't open. 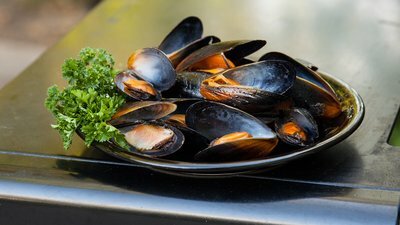 Mussels will keep for a day or two in the refrigerator if placed in a bowl and covered with a damp paper towel. Don't store them in a plastic bag, or you risk suffocating the little guys. Almonds, walnuts and other nuts may get all the glory, but the humble seed of the sun-worshiping plant can deliver a big nutrition bang for your buck. While typically much less costly than nuts or even chia seeds, sunflower seeds are no nutritional slouch. Most important, this stellar seed provides a range of important vitamins and minerals, including thiamin, magnesium, copper, selenium, and vitamin E. As a bonus, sunflower seeds also contain about 6 grams of protein in a 1-ounce serving! In the kitchen: Toss shelled sunflower seeds onto your morning oatmeal, bowls of yogurt, and dinner salads for a healthy boost. Or keep it simple, and have a handful or two. Both animal and plant-based proteins can help you attain a fierce physique. In the case of the latter, consider protein-loaded lentils. This mind-blowingly cheap source packs a whopping 13 grams per quarter cup (dried)! For only a buck or two a pound, you can get one of the ultimate nutritional overachievers of the supermarket. Lentils supply sky-high levels of dietary fiber (16 grams per one cup cooked), and are rich in folate (230 percent of RDA), B-2 (44 percent of RDA), B-3 (25 percent of RDA), and iron (80 percent of RDA). In the kitchen: Unlike dried beans, lentils do not require you to think ahead and soak them before cooking. Just simmer dried green or brown lentils in a pot of water until tender, about 20 minutes. Don't overcook the lentils, or they'll turn mushy. Try them in salads, tacos, soups, and stir-fry. Pound for pound, whole chicken results in less financial pain at the checkout counter than individual cuts. It all comes down to labor; a bird with more of its parts intact requires fewer man-hours to get ready for sale, and thus boasts a cheaper price tag. Uncooked, whole chicken is often a better value than supermarket precooked rotisserie chicken. Sure, you sacrifice some convenience, but the deliciously juicy meat can serve as the backbone for many different quick meals. In the kitchen: Season a chicken with olive oil, salt, and pepper, and put half a garlic head, a quartered lemon, and some fresh thyme into the cavity. Tie the legs with twine, and roast the chicken breast-side down in a roasting pan at 425 degrees F until an instant-read thermometer registers 160 degrees F when inserted in the thickest part of the thigh (avoid touching the bone with the probe) and juices run clear, about 15 minutes per pound of bird. Let rest at least 15 minutes before carving. Posadas-Sánchez, R., Posadas-Romero, C., Cardoso-Saldaña, G., Vargas-Alarcón, G., Villarreal-Molina, M. T., Pérez-Hernández, N., ... & Torres-Tamayo, M. (2016). Serum magnesium is inversely associated with coronary artery calcification in the Genetics of Atherosclerotic Disease (GEA) study. Nutrition Journal, 15(1), 1. Heinonen, K. (2014). Farmed Mussels. Monterey Bay Aquarium Seafood Watch.